How much alcohol constitutes alcohol abuse? We extract markers from the hair that only appear when someone has consumed alcohol. These markers are metabolites and can only be produced when alcohol is in the body. What will the results indicate? When a drug such as alcohol is being broken down by the body it reacts to form intermediate substances that the body eventually removes in urine, feces, or breath. These intermediate substances are called metabolites. Can I tell if somebody has been consuming excess alcohol? Yes, the concentration level for the respective marker will match or exceed its cut-off point identifying average consumption levels in excess of 60 grams per day. The more alcohol someone has consumed the higher quantities of this marker present and detected. The sensitivity level or ‘cut off level’ used correlates with alcohol abuse; or consumption of greater than 60 grams of alcohol a day. This is an established and well-recognized threshold. Can I tell if somebody is still drunk? No, it takes about a week or more for the marker to appear in the hair on the scalp. We are only interested in regular alcohol abuse levels. Breath alcohol is still a very good solution for determining inebriation. As far back as the length of the hair will allow. Hair grows at the rate of about 10-12mm per month and we take the first 6 centimeters of hair when the hair is of sufficient length. That relates to a period of around 1 to 6 months from date of collection. Hair offers an excellent historical record of alcohol history, which now for the first time we are able to unlock. Can I recognize a pattern of abuse? No, because we do not section the hair month by month and carry out periodic analysis. Our research has shown this is unsound scientific practice because the markers can migrate along the hair shaft. Can I use body hair? Yes, natural length body hair provides evidence for up to 6 months. What if my shampoo or hair product has alcohol within it? Because this technology examines only alcohol metabolites which can only be produced by alcohol that was metabolized by the body, products containing alcohol do not demonstrate an affect on the levels of EtG measured by the test. However, studies have shown that there could be elevated levels of FAEE as a result of using hair products containing alcohol (see: Practical experiences in application of hair fatty acid ethyl esters and ethyl glucuronide for detection of chronic alcohol abuse in forensic cases. – Forensic Science International, 2011). This is because cells on the top of the head have been demonstrated to be capable of metabolizing alcohol and leading to an FAEE byproduct. The laboratory will only report a positive result when these independent markers are detected in their correct ratios. Note that the laboratory needs to be informed of this through the COC document so that it can be taken into account during analysis. We require about 100 mg of hair. That is a tuft of hair a bit bigger than the size of a pencil diameter, and about 100 strands. The hair can be taken from more than one location and the sampling site us usually unnoticeable. What is the difference between LEGAL and PERSONAL testing? How do I take the hair sample? We have trained collectors to do that for you, or we can train someone at your organization to do the collection. Is the collection difficult then? No, but collection is an important part of the process and nearly always needs to be done under strict ‘chain of custody’ rules so that everyone involved can be certain that the sample relates to the correct person. 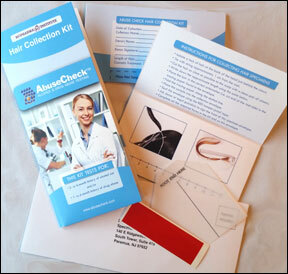 What situations would I consider using hair alcohol testing? There are many applications where you would want to determine whether someone had an alcohol problem, or indeed prove they didn’t have a problem. Obviously, we need hair. Occasionally drug screening companies encounter someone who has shaved from head to toe, with not a single hair on their body, but that does raise suspicions. Can you tell whether someone is totally abstinent from alcohol? No, the Hair Alcohol Testing methods have not been developed for that purpose. EtG and FAEE testing are now two methods available for use, to detect consumption of alcohol over a longer period ranging from one month and up to six months. No other method can do this. What is EtG and FAEE? “EtG” stands for ethyl glucuronide and “FAEE” stands for fatty acid ethyl esters. Both are direct and very specific alcohol markers, which are metabolites produced by the body when alcohol is consumed. These markers cannot originate from other pathological reasons. What kinds of samples are used for both tests? Samples of hair, ideally at least 3cm in length and no shorter than 1 cm (head hair). What is the difference between EtG and FAEE? The EtG marker is formed almost exclusively in the liver and is deposited into hair mainly from sweat. The FAEE marker is formed in blood and all tissues and gets into hair mainly by diffusion from the external sebum layer. Unlike the detection of drug metabolites in a hair test, environmental contamination (for example, being exposed to a drinking environment at a pub) can result in the detection of traces of ethanol. However, such traces as these do not correlate to the consumption of alcohol. Why would I choose to use one test over another? It is all case-dependent as to which test to use. If you wish to provide an average result up to six months, the FAEE test would allow this. Do you recommend against using either test-technology in isolation? In order to reduce the possibility of false positives to a minimum (1%), it is recommended that both markers need to be tested for, simultaneously. 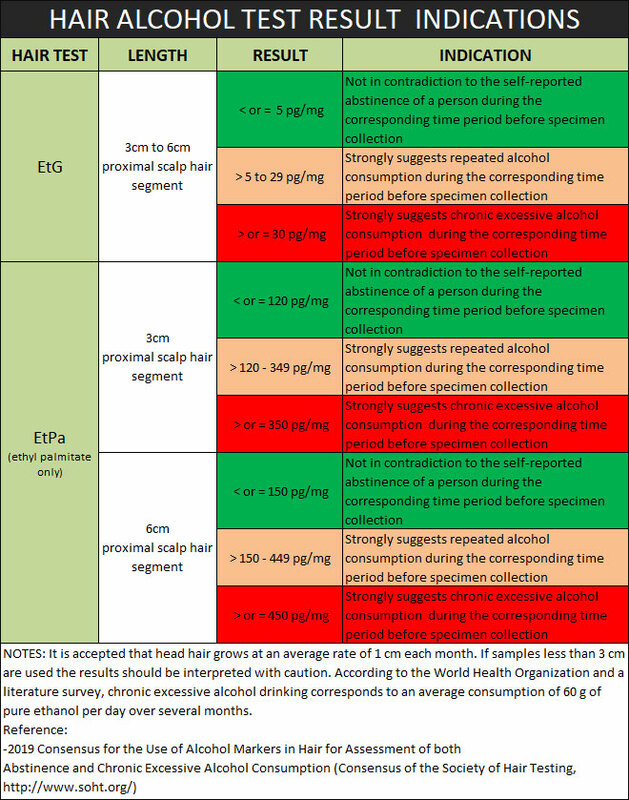 The Society of Hair Testing recently introduced their consensus which states that FAEE and EtG methods should be used simultaneously for detecting chronic excessive alcohol consumption assessment. Some companies offer only EtG testing. What are the disadvantages of this? It is recommended that EtG testing is performed on the most recent 1-3 months of hair growth (approximately 0 – 3cm from the scalp). That is due to the fact that using the EtG test in isolation carries the risk of the ‘wash-out’ effect whereby the frequent washing and intense shampooing of a donor’s hair slowly removes the EtG marker that has been deposited onto the hair. As a result, this marker is sensitive to false-negative results. It is recommended to combine FAEE when EtG is used at all times. If there is a ‘wash-out’ effect when testing EtG with the potential risk of false-negative results, is this test still useful? Yes, the test is still very useful because it does what testing blood cannot do — that is to test for alcohol abuse for periods of one month and longer. 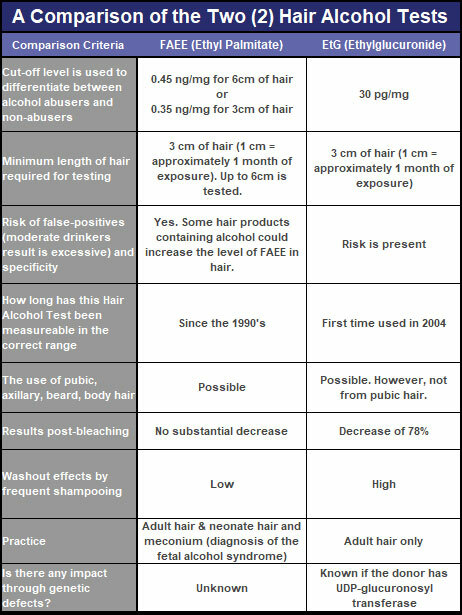 In line with the recent consensus of the Society of Hair Testing (June 2009), EtG testing should only be recommended on head hair samples of no longer than 0-3cm or on body hair samples. Pubic hair samples are not recommended if testing for EtG alone due to the risk of potential contamination from urine. Does the ‘wash-out’ effect apply to FAEE testing? No. FAEE markers are relatively stable in hair. A study showed that the effect of hair care and hair cosmetics on FAEE concentrations, and 20-times the usual shampooing of hair samples of heavy drinkers did not significantly decrease the concentration. Is the combination of both tests therefore better and more accurate? Yes. The combined EtG and FAEE tests certainly increase considerably the accuracy of the interpretation. Agreeing positive or negative results enable an almost unambiguous interpretation. The members of the Society of Hair Testing met in June 2009 and agreed that the testing of both parameters is useful for mutual confirmation and for the exclusion of false positive or false negative results. My client uses an array of hair products including hot oils, shampoos and hair sprays with high alcohol content and washes her hair on a more than regular basis. Does my client need to disclose this information at the time the samples are being collected? Yes. Information such as this would benefit the laboratory’s analysis of the results as best possible. The more information is provided, the more interpretative the results will be to explaining any abnormalities. It is requested that this information is provided at the time of the sample collection and provided on the chain of custody documentation. Is there the possibility of disagreeing results if both tests are carried out? Yes, this is possible. In the case of a negative result with a positive, the absolute value of the concentration of the positive marker is of particular importance. Does the EtG and FAEE concentration found in my client’s test results equate to the quantity my client has consumed? No. We cannot quantify the exact amount of units your client has been drinking, as the lab does not measure the alcohol itself, but rather identifies and quantifies metabolites produced by the body once alcohol has been ingested. Results cannot be quantified into consumption levels due to differences in alcohol metabolism and physiology in hair growth; including the differences in hair care (for example, frequency of shampooing). As with all medically-based tests, results are not subject to the linear laws of basic mathematics. 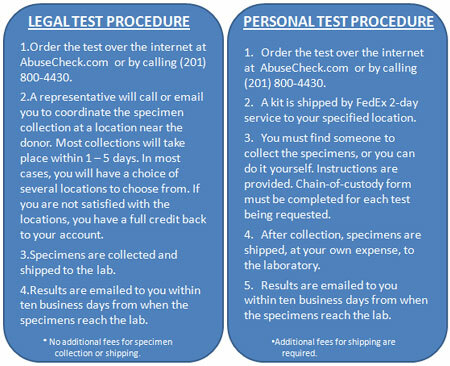 If you cannot determine the quantity of alcohol consumed from the test results, what do these tests determine? The lab determines whether the donor falls above or below the cutoff level that we have set, which is 60 grams of pure ethanol per day over a protracted period. What is meant by a “positive” result? A positive result is reported when the total concentration of FAEE and/or EtG values exceeds the Cut-Off level which correlates to 60 grams plus on a daily basis (see previous question/answer). Is it possible to determine whether a positive test result is due to binge drinking or high regular consumption? No. Unlike other drugs which are deposited through the root alone, FAEEs are deposited through both the root and the sebum produced by the sebaceous glands in the scalp. This means it is possible for sections of hair to have lost or gained concentrations of FAEEs through the migration of sebum along the follicle which could distort any timeline analysis. It is therefore only possible to provide an average level of consumption for the period of time being tested for. Similarly, the fact that most peoples’ hair does not stick up out of the scalp, but lies against the scalp surface for several centimeters as it grows down, means that more mature sections of hair are being bathed in the EtG-laden sweat which is produced by the sweat glands, thus making it scientifically unsound to offer segmented results on a month-by-month basis from which to establish a chronological pattern of consumption. It is therefore only possible to provide an average level of consumption for the period of time being tested for. Is it possible to provide a chronological analysis of a subject’s drinking history? Not with a single test (see above). However with a series of tests conducted at regular intervals, a very accurate picture of a subject’s level of consumption can be obtained. By comparing two or more results we can tell whether a subject’s consumption has increased, decreased or remained constant and if it has varied, by approximately how much. Is it possible for a couple with similar drinking habits to return different test results? Yes. Physiological differences such as weight and metabolism mean everyone’s ability to process alcohol is different. Weight is particularly influential and taken into account when interpreting borderline cases. How is it possible for someone who only drinks over the weekend (Fri – Sun) to test positive? If consumption over the weekend or other limited periods is high enough to produce an average daily value above the cut-off level, the result will be positive. If a subject’s test result is, say, 8 times over the cut-off level does this mean they are consuming an average of 8 x 60 (480) grams per day (60 units of alcohol)? No. Although there is a significant correlation between alcohol intake and the concentrations of marker in the hair there is not a linear relationship between the two. Can a subject who returns a negative result one month after returning a positive result be said to have abstained completely in the intervening weeks? Concentration levels below the cut-off level may be a product of abstinence but this cannot be guaranteed; however falling concentration levels for a particular subject do indicate declining levels of consumption. Can I test for both EtG and FAEE at the same time without having to work with two separate companies? BioPharma Institute offers the combined test (EtG and FAEE), also known as the “Gold Standard of Hair Alcohol Tests” to ensure that accuracy of your results can be achieved. This will also minimize the hassle and inconvenience of having to use two companies. Working with a company who prides itself on service and testing excellence, you can be assured that the tests are carried out with utmost accuracy and speed. The lab can provide expert opinion on results from other laboratories but will not run FAEE from its laboratory, and analyze EtG results carried out by another company. Both tests must be run at our lab for optimal result output and analysis using similar analytical methods. My client does not have any head hair, can body hair be used for both tests? Yes. Pubic, axillary, beard and other body hair can be analyzed if head hair is not available. We note that pubic hair samples are not recommended if testing for EtG alone due to the risk of potential contamination from urine. What is GC/MS/MS and what does it mean? Gas chromatography / tandem mass spectrometry is a confirmation level test which is used to accurately assess the metabolites of alcohol in hair. It is a much more recent technique than GC/MS and allows for a higher level of selective analysis. What information will the report show? It will include the identity details for the sample that has been sent to us, and then a result for the alcohol level that has been detected. A ‘negative’ or ‘positive’ result is provided dependent on whether the result falls below or above the cutoff level set by our laboratory. Results can also be provided in a standard Section 9 legal statement where requested. Can you determine how much alcohol a person has had monthly? No. Although we will give a value in our report, we can only say that the value exceeds our interpretation of the cutoff level we have set, which is 60 grams of alcohol per day over a protracted period. We cannot interpret how much alcohol was actually consumed. To do so would be scientifically unsound because alcohol is metabolized in slightly different ways by different people. How much alcohol is “60 grams”? How many glasses of wine or pints of beer does this equate to? It has been widely considered in the United Kingdom that a level of 60 grams of alcohol and above consumed daily represents alcohol misuse. In the UK, alcohol is based on units to allow drinkers to establish their alcohol consumption. One unit is 8 grams (10 milliliters) of pure alcohol. However, the amount of drink that equates to 60 grams depends on how strong the drink is. On average, one pub measure of wine, one half of average strength beer, and one ‘short’ of spirit are all one unit. So seven of these units provides 7 x 8 = 56 grams of alcohol. A 750ml bottle of wine with 13% alcohol by volume would contain 9.75 units. See the Bupa alcohol calculator in our Resource Section to see how many units has been consumed. For an individual who is strictly abstinent, would I expect a ‘zero’ result? Alcohol is not as easily detectable in hair as other drugs. Ethanol is present in all hair including those of teetotalers, however these traces are products of the environment. Simply being in a pub or laboratory is enough for traces of ethanol to find their way into the hair. A case study on a group of individuals who were strictly abstinent were found to have small traces of ethanol in their hair samples. However, these traces of ethanol do not correlate to alcohol which has been consumed. Where does the process originate from? It has been developed by a combination of German and English laboratory collaboration using leading experts in this field and the latest analytical technologies. Can we tell if an excessive drinker really has stopped drinking? No. However, what we can tell is whether the individual has stopped drinking excessively, provided his concentration levels have dropped below the cut-off level. Where there is evidence of falling concentration levels which are not yet below the cut-off level all that can be said with certainty is that drinking levels are declining. Can a reformed alcoholic be monitored? Yes, the lab can monitor a reformed alcoholic using its new technological advances. According to a study, in cases where a relapse follows a period of abstinence of more than one year, binge drinking lasting several weeks is sufficient to give a positive finding over the whole length of hair. This corresponds to our experience: a relapse can be detected after two to four weeks. Please note: For this test we also require, where possible, 6 cm of head hair (standard conditions). Is there a risk of false positives? Mitigating circumstances could include a serious abnormality in the metabolism of the donor or abnormal hair growth conditions such as hirsutism, or indeed recent donor hair transplanting. The lab has introduced a medical review document for donors that should be completed and supplied with the sample, for optimum accuracy that will identify such conditions. While we would offer constructive advice on such occasions, they are not encountered or required very frequently. The lab has led the field in this work and is the only organization worldwide to offer this service coupled with a thorough and considered medical review, and as such is committed to offering as much information and advice as possible to clients. Can hair treatments affect results? Some hair treatment products which contain alcohol may result in an increase of FAEE in the hair. There has not been any influence on FAEE results from non-alcohol containing cosmetics or shampoo. There may be occasions when this should be considered (example: hair modeling where the hair is constantly being styled). Recent alcohol application to the scalp for head lice will also not affect the results. As noted above, intense shampooing and bleaching could cause a ‘wash-out’ effect to EtG markers, removing the markers already deposited onto the hair, and increasing the risk of false-negative results. Our experience in this field would allow us to offer constructive advice on such occasions. For most accurate result, we recommend that EtG and FAEE testing are preformed concurrently. Where can I learn and read more about Drugs and Alcohol? The lab has researched a number of leading books that could act as a way to help our clients understand the impact of drugs and alcohol on their patients/donors or internal clients. Please visit our Drug & Alcohol Literature section for more information. “FAEE” stands for fatty acid ethyl esters, a direct and very specific metabolite of alcohol, produced in the body when alcohol is consumed. It provides a greatly specific indicator of excessive alcohol consumption over a 0-6 month period of time. Studies have showed that FAEE markers are relatively stable in hair, and that the effect of hair care and hair cosmetics on FAEE concentrations did not significantly decrease concentrations. “EtG” stands for ethyl glucuronide, a direct and very specific metabolite of alcohol, produced in the body when alcohol is consumed. It provides a good indicator of excessive alcohol consumption over a 0-3 month period of time. It is recommended that EtG testing is performed on the most recent 0-3 months of hair growth (approximately 0 – 3cm from the scalp). That is due to the fact that using the EtG test in isolation carries the risk of the ‘wash-out’ effect whereby the frequent washing and intense shampooing of a donor’s hair slowly removes the EtG marker that has been deposited onto the hair. As a result, this marker is sensitive to false-negative results. It is recommended that the EtG test always be combined with the FAEE test.